What does ‘Zero Waste Policy’ really mean? For me, it means just that: zero waste. Green Embassy’s haute couture collections are famous for their GOTS certified organic cotton, silk and wool textiles; but part of the commitment to sustainability includes, for me, not adding to Australia’s landfill problem. However, it isn’t just about minimising landfill. The Green Embassy Zero Waste Policy also rests on the fact that I work very hard on creating textiles and fabrics from their raw state, taking each item through the entire production process, from the field to the catwalk. It’s surprising how precious each piece of fabric becomes when you spend that much time and energy on it. As a result, all scraps and fabric cutoffs from the creation of the current collection will also become part of that collection, or sometimes an upcoming collection. Everything is used, even the smallest parts, until the remaining threads are negligible and can be added to garden compost. In the end, the declaration of Eco-fashion must carry with it the strongest commitment to the whole ecological picture. Not just organic textiles, but also fair trading practices and sustainable waste management. To illustrate how I make this happen I have taken some photos of instances where I have utilised ‘scraps’ from other creations to inspire or embellish a new piece. Silk fabric strips and scraps are refashioned into delicate, feathery tendrils on a cocktail dress. Cotton offcuts coloured with plant-based dyes can make perfect pieces to stitch into other textiles to add texture. They are also wonderful for colouring new lengths of textile – for example, some small pieces of black organic cotton created beautiful shimmering grey shadows when used in the cooking process to eco-print a length of silk. 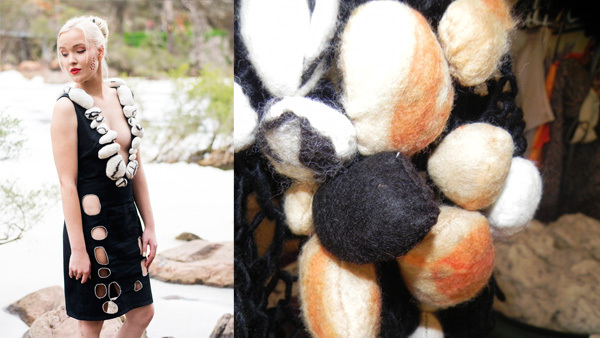 I use merino and alpaca wool to spin and felt, but the pieces of fleece unsuitable for wool textiles are used as stuffing in sculptures that add amazing texture to some of the headpieces and gowns in my new collection. 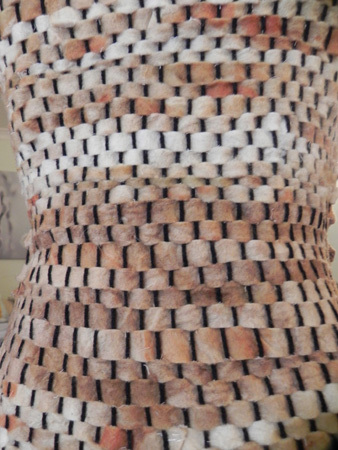 I also weave woollen offcuts to become fabric once more: the offcuts from the dress I recently worked on for Mrs Australia were woven on my upcycled wooden loom into a panel of fabric that will form the bodice of a new evening gown. 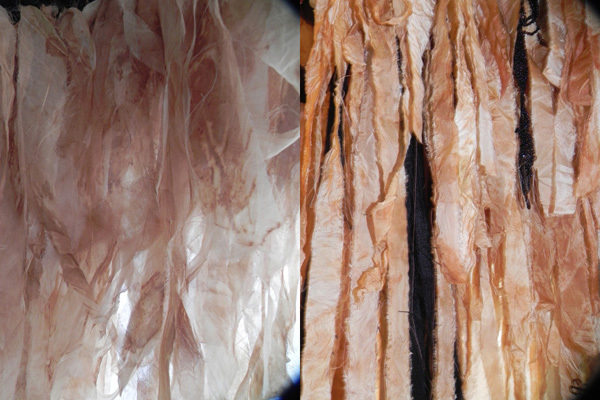 I love how the weaving process allowed me to create a sedimentary cliff-face of colours. The recent introduction of semi-precious stones to my pieces has also allowed me to reuse fabrics as backing for body jewellery using these stones and beads. These pieces are all within the Connected to Land collection that will soon see the bright lights of Vancouver Fashion Week, followed by Paris. I cannot wait to show you the full range.